A nervous or timid dog will make mistakes. If you notice any of the cues below stop the drill and take a break. Before you begin drills again, get back on good terms with your dog. 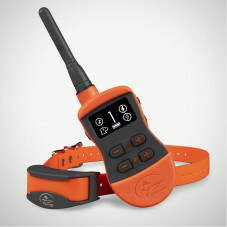 This resets your dog from thinking you are angry or frustrated with it. Tail between its legs: This indicates the dog is scared or ashamed. The point of the tail tuck is to make itself as small as possible. You’ll usually notice the dog makes this gesture when you use a strong tone of voice. Excessive yawning: Yawning late at night or after waking up is normal. If you see yawns in the middle of training, while you are correcting your dog, it’s likely nerves. The yawn is a way the dog relieves tension in uncomfortable situations. Ears pinned back: Instead of the usual hanging down or perked at attention, the ears are actually laid back against its neck. This is a sign that the dog is nervous. Whether hunting or doing drills, you want dogs to be excited to get the job done. However, be sure you maintain control. Find a balance between your dog’s excitement level and the attention you need for listening to commands. Tail up: Typically, an excited dog’s tail is up in the air, wagging. When the dog is really excited, it may even start to wag its body with the tail. Posture: An excited dog stands upright, possibly pacing back and forth with attention on the task at hand. Dogs typically bounce around in anticipation for what’s to come. You may also notice the dog shivering: Likely a reaction to excitement as opposed to being cold or scared. Like people, dogs can reach a point of exhaustion. It’s important to watch for signs indicating your dog has had enough. Exhausted or not, a dog’s nature is to keep going if you give a command. Once your dog has gone past its limit, you run the risk of injury. Pace: When tired, a dog slows its sprinter’s pace down to a trot or a walk. When you say “sit,” it may lie down. Another clear sign that your dog has had enough is refusal to retrieve. If your dog typically retrieves everything you shoot, then suddenly stops, chances are it’s time to give the dog a break. Heavy panting: This typically happens during warmer months when your dog isn’t used to the heat. If you notice its saliva is thick and the dog is panting heavily, it’s reaching the point of heat exhaustion. Give the dog a break and get it some water. Pushing the dog too far in the heat can lead to serious injuries or even death. Confusion/Mistakes: When we talk about tired dogs, we typically are talking a physical state, but there is another side. Dogs also can become mentally tired. When you combine the two, it can lead to mistakes in the field. If you notice your dog has slowed down and started making frequent mistakes, take a break or call it a day. Put yourself in the dog’s position. You just ran three miles, you go inside and someone immediately asks you to do 15 tasks. It would be difficult to keep the tasks straight if you were out of shape and trying to recover. The same goes for dogs. The cues mentioned above will be difficult to read and understand in the beginning phase of getting to know your dog. With time, you’ll begin to understand what the dog is telling you, just as dogs learn to understand what we are telling them. The key is to have a working line of communication between you and the dog to experience success.